As you plan your upcoming project, stay organized by adding the products that interests you to a project list found on each product page under the ordering information tab that can be edited to be a complete bill of materials ready to be quoted. 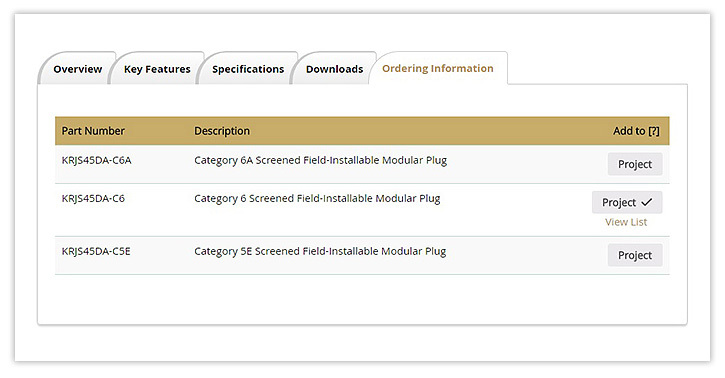 While you are browsing through our products, the ordering information tab will have a button to the right of each part number that says ‘Project’. 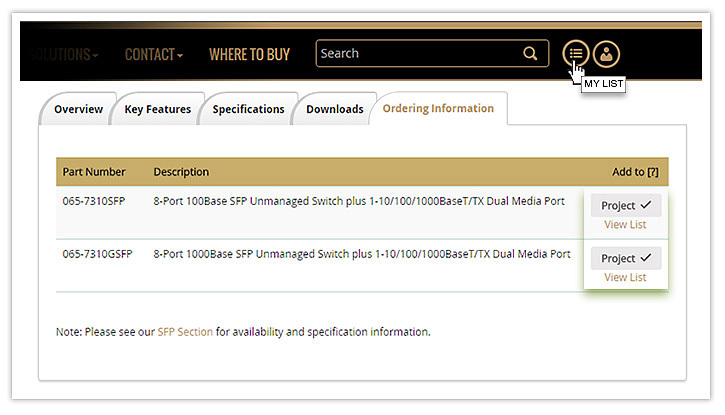 Get started by clicking on the Project button to add the part number that matches what your upcoming job requires. This will add that particular part number to your project list. Feel free to continue to browse the site for any other products that will fit your project’s needs and repeat the process to add additional items to your project list. Maybe there are similar products that could work for your specifications, add both to your list to get quotes and decide later which one works best. You also have the option to contact Signamax’s Technical Support and one of our Application Technicians will be eager to assist you with any product comparisons. Once you are finished browsing and are ready to review what is on the project list you can either click on View List, which shows up under the project button once something has been added, or you can go to the My List icon located just to the right of the search box on the top menu bar. The Project List page will have your selected products and can be edited to delete any duplications or to adjust quantity. There is also an option to print this list for your records and if you are not quite ready for a quote, it will make an easy reference sheet to find the products you reviewed. 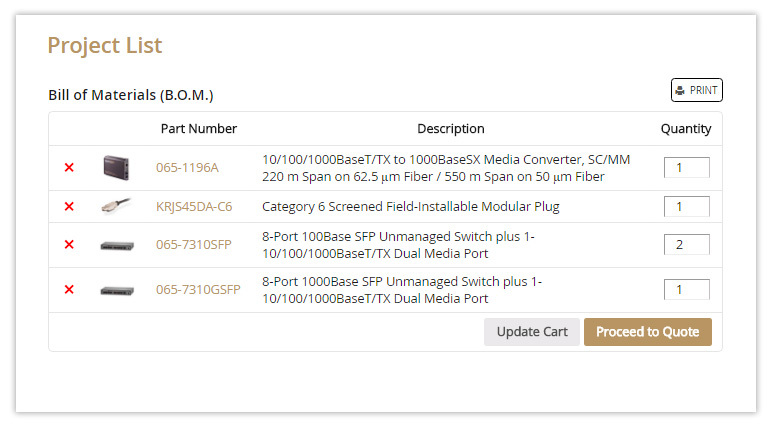 Once you have completed any changes, update the list by clicking on the ‘Update Cart’ button and then click on the ‘Proceed to Quote’ button on the bottom right to continue to the next step. The next step is to fill out our company information form that helps keep you organized and connected. 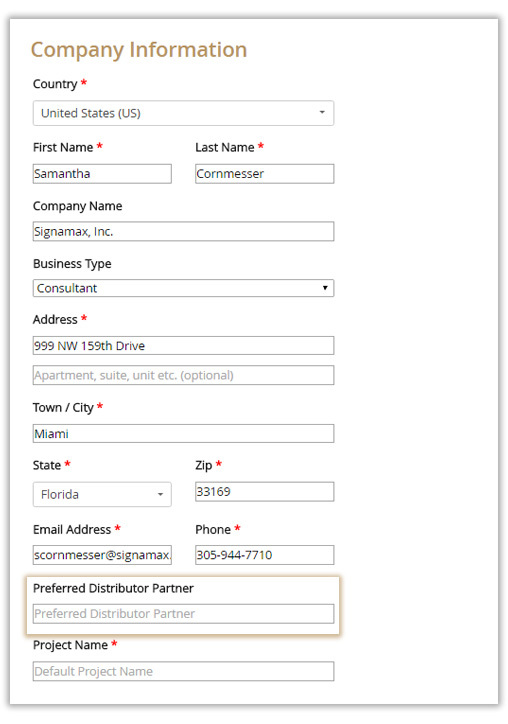 By filling out the form, you are creating an account with Signamax – please note that this information is for Signamax, Inc. use only and we do not pass it along to any third parties. We value your privacy and have security measures in place to ensure your information is protected. Required fields are noted with (*) but don’t miss the optional space for you to specify your preferred Distributor partner if you have one. If you do not have an account set up, you will be prompted to create a password at the bottom of the form that you will use each time along with your email address to login and access your submitted quotes. If you have already created an account, there is a link below for a returning user that will take you to the login screen. Before proceeding, review your project list to ensure the information is accurate and then click the ‘Submit Quote’ button. Note: Your project list will not be saved to your account until it is submitted for a quote. Once the quote has been submitted you will be directed to the Confirmation screen. 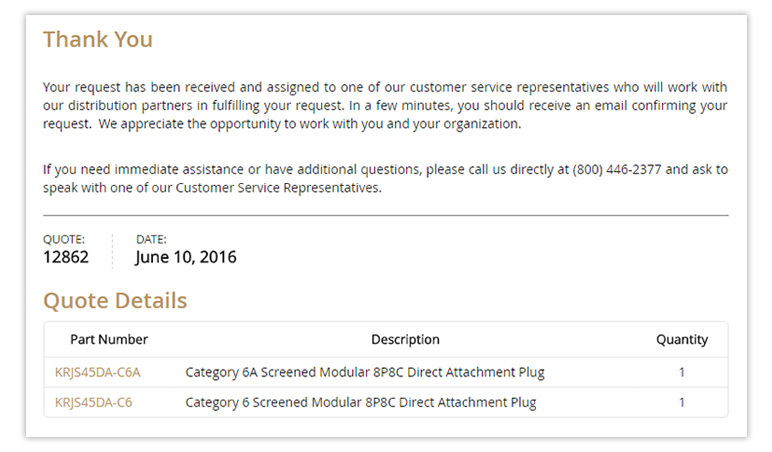 At this stage, the quote has been received and assigned to one of our customer service representatives who will work with our Distribution partners in fulfilling the request. In a few minutes, you should receive an email confirming your request. The Confirmation screen and your confirmation email will show the date of the submission and a quote number for reference when checking the status. At any time you can login into your account and check the status or just review your past quote submissions. Each quote will be listed with the newest request being on the top of the list. To make it easier to find quotes for a particular project, we have included the project name you filled out on the customer form. Along with the project name you will also have the status, date, and quote number for each listed. The ‘View’ button on the right gives you access to view the project list with the part numbers, description and quantity all laid out. Now imagine that the project is moving forward and you need a specification sheet or drawing for a particular item you had quoted. Each part number on the project list is a link to that particular product’s page with all the relevant information including a downloads tab for specification sheets, drawings, and even user guides. That is how Signamax is Keeping Your World Connected & Organized. Signamax, Inc. believes serving customers extends beyond technology and encourage open dialogue to continually grow our knowledge, improve performance, and provide our customers with the best service. If at any time you have any further questions, our Customer Service department is ready to assist.